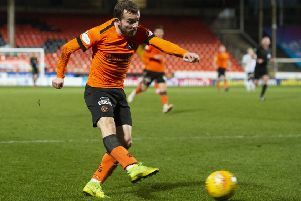 Dundee United have posted losses of £1 million for the financial year ending June 2017, with chairman Mike Martin confirming that the club will continue to run at a deficit unless they return to the Ladbrokes Premiership. The Tannadice outfit implemented £2.2m worth of cost-cutting measures, while expenses were down by 30 per cent as they adjusted to life in the Championship. However, those efforts were not enough to offset a massive drop in revenue from £4.6m to £3.5m compared to the previous year. That 24 per cent reduction was attributed to falling attendances, a fourth round exit in the Scottish Cup and reduced prize money. Losses have been reduced by a third from the £1.5m figure in 2016, while the overall debt level has been reduced to £1.8m from £7.3m in the space of ten years. Nevertheless, Martin, who replaced Stephen Thompson at the helm last week, acknowledges that the club have little hope of returning to profitability while they remain in the second tier. He said: “The club continues to address the financial challenges of life out-with the top league. While we remain in the Championship we will continue to incur losses. United, who face Brechin City today, are currently in third place in the Championship, 17 points behind league leaders St Mirren. The 30-year-old, who trained with the club on Thursday, played under newly-appointed chief scout Paul Sturrock at Southend, and Sturrock has moved quickly to recommend the free agent as a potential signing. Mohsni’s first spell in Scotland came to a controversial end in May 2015, after Rangers had lost to Motherwell in the play-offs. The Tunisian international kicked and punched Motherwell forward Lee Erwin after the final whistle and was slapped with a seven-match ban for his part in the post-match fracas. He quit Scottish football that summer.